Last night Thursday, June 20, 2013, Facebook owners of Instagram introduced a video recording option for the online photo-sharing and social networking service. It really doesn’t come as a surprise with other social media platforms like Vine and Keek luring users away from IG. With the rate of instant Instagram upgrades, Charlie White of Mashable.com has written in seven 7 simple steps how to record an Instagram video. Instagram video, a new feature of Instagram 4.0, is now available for download, and we tested this new and super-easy video shooting and sharing capability. 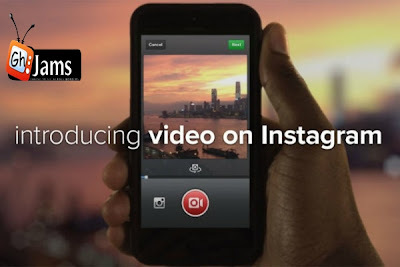 Below is a pictorial view of how to create your own videos using the new Instagram 4.0. After you install the new version of Instagram, tap on the middle icon with the blue background, as if you’re going to take a picture with Instagram. After that, tap the movie camera icon to the right of the Instagram camera. When you’re ready to start recording video, press the red movie camera button — as long as you keep pressing, the video will continue recording, up to 15 seconds. You can create videos shorter than 15 seconds, down to a minimum of three seconds. When you take your finger off the movie camera icon, the recording stops. Each shot is represented as a blue segment on the timeline. If you’re not happy with the shot you just took, tap the X icon to the left of the movie camera, and that segment will turn red. Tap again on the trash can, and it’s gone. Using this routine, you can only delete the last segment you shot. Just like the photo section of Instagram, you can choose one of 13 new filters. Regardless of filter, Instagram’s Cinema feature is enabled by default, deftly reducing shake and processing in the background (you can turn it off by tapping the shaking camera icon). It did a great job of smoothing out this video, but some other extremely shaky videos I tested didn’t fare as well. Still, it’s a remarkable achievement. Here’s where you can choose the most pleasing cover frame. In this example, I chose the first option. At this point, the routine will look familiar to Instagram users, where you choose a caption, decide whether to include it on your photo map, designate a location, and share it beyond Instagram to other social networks or email. Here’s the final result, showing up on your Instagram feed just like photos do, with the exception of videos displaying that arrow on the top right corner. The video begins playing (with audio) as soon as you pause scrolling in your feed, and doesn’t loop like Vine videos — you must tap a video to play it again. By the way, if you don’t want videos to play automatically in your feed, go to Instagram’s settings (the gear icon in your profile tab), and under Preferences, slide the Auto-Play Videos switch to Off.